We’re having second thoughts on our car mechanic because he just keeps on delaying our schedule for the car repair. I really want to know if he’s going to repair our car or we’ll just have other repair shop pick it up. Days are quickly passing by and we need it in good shape for our long travel for December camp meeting. I also need it to be ready for its yearly auto insurance early next year. I’m discussing this problem with my sister and hubby and they agreed to have the car picked up by another repair shop though it’s more expensive that way. This is my entry for this week's theme of Thursday Challenge's Music. 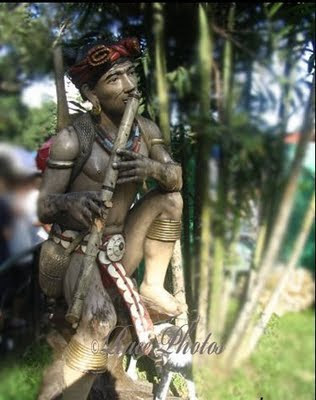 This is a wooden statue of a Filipino native playing a native musical instrument made of bamboo. The natives don't buy musical instruments in the past, if they want to have music they make their own musical instruments which for me is very ingenius and resourceful. This shot was taken in the entrance area of Manila Zoo during my daughters' educational tour. See more Thursday Challenge 'Music' entries here!